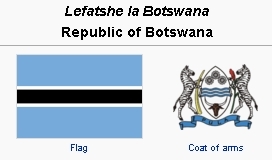 Botswana was formerly the British protectorate of Bechuanaland until it gained independence from Great Britain on 30 September 1966. A Mennonite presence began soon after, with the arrival of Mennonite Central Committee (MCC) workers in 1968. Initially emphasis was placed on secondary education and teacher training. The MCC program expanded into agriculture and the training of skilled laborers, e.g., mechanics and bricklayers. Later it moved into the area of community development. As MCC workers became more involved in the community they became increasingly aware of African-Initiated Churches (also known as African Independent Churches). Africa Inter-Mennonite Mission (AIMM) began work with these churches in 1975. In 1981 the administration of MCC and AIMM programs was united under Mennonite Ministries in Botswana. In the following years, Mennonite Ministries had personnel working in the areas of Bible teaching among African-Initiated Churches, community development, education, youth ministry, friendship evangelism, teaching and issues related to families, and health, particularly in AIDS education and counseling. Beginning in 1975, six Mennonite denominations had sent workers to Botswana. Mennonite Mission Network. Botswana. Web. 10 October 2008. http://www.mennonitemission.net/Work/International/locations.asp?L=Botswana. Mennonite World Conference. "World Directory=Directorio mundial=Répertoire mondial 2012." Web. 26 November 2013. http://www.mwc-cmm.org/sites/default/files/website_files/mwc_world_directory_w_links_minus_cover.pdf. Sawatzky, Ronald D. and Richard D. Thiessen. "Botswana." Global Anabaptist Mennonite Encyclopedia Online. March 2011. Web. 25 Apr 2019. http://gameo.org/index.php?title=Botswana&oldid=115217. Sawatzky, Ronald D. and Richard D. Thiessen. (March 2011). Botswana. Global Anabaptist Mennonite Encyclopedia Online. Retrieved 25 April 2019, from http://gameo.org/index.php?title=Botswana&oldid=115217. Adapted by permission of Herald Press, Harrisonburg, Virginia, from Mennonite Encyclopedia, Vol. 5, p. 93. All rights reserved. This page was last modified on 8 March 2014, at 09:04.